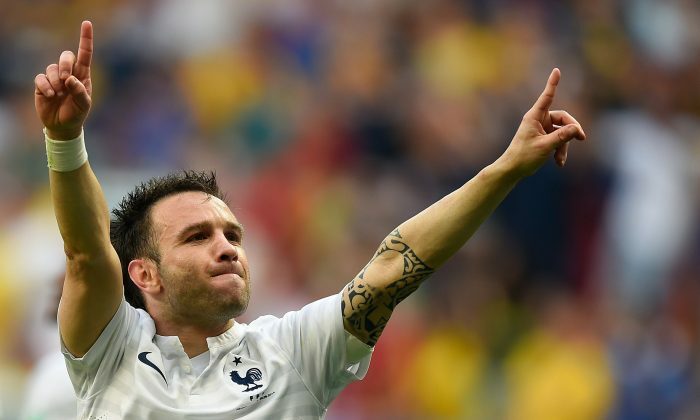 Mathieu Valbuena Transfer News: France Star Moving to Arsenal, Liverpool? Mathieu Valbuena could be on his way to an English side this summer. The 29-year-old French international has been in impressive form at World Cup 2014, scoring and creating a goal against Switzerland, and contributing excellently to France’s overall play in general. And according to France Football, Arsenal and Liverpool are “monitoring” Valbuena’s transfer availability. Napoli, Valencia, and Fiorentina are also said to be interested. Valbuena’s agent, Jean-Pierre Bernes, has also recently come up to say that the Marseille player could move, even though he has three years left on his contract. “He has a contract with Marseille and that is not a small club, it is a great French club,” Bernes told L’Equipe. RIO DE JANEIRO (AP) — When Germany goalkeeper Manuel Neuer embarked on a series of hair-raising dashes out of his area in the second-round win over Algeria, it would have struck a chord with French football fans of a certain vintage. Thoughts no doubt returned to one of the most shocking collisions in World Cup history, which occurred in the 1982 semifinal between West Germany and France and involved another goalkeeper’s excursion off his line. Harald Schumacher’s airborne challenge on Patrick Battiston, which knocked the France defender unconscious and broke his jaw but went unpunished, still raises anger and emotion in France — particularly as West Germany went on to win that match in a penalty shootout thanks to the saves of Schumacher. Predictably, the incident has been one of the major talking points ahead of the countries’ clash in the World Cup quarterfinals on Friday. It will be their fourth meeting on football’s biggest stage, with Germany also winning the most recent head-to-head in 1986 in the semifinals. Under the headline of “A Classic Match,” top-selling French sports newspaper L’Equipe used its front page Wednesday to detail the step-by-step process of Schumacher’s aerial collision with Battiston. Clearly, the episode hasn’t been forgotten in France but many of country’s players weren’t even born when that game took place. And they aren’t using it as motivation. Germany is playing in the quarterfinals for a ninth straight World Cup and also reached at least the semifinals of the last two European Championships. But there is a growing feeling that a young and dynamic France team can bring down its more experienced opponent. With Germany’s defense stretched — and sometimes shambolic — this tournament, that’s a department the French will aim to exploit at Rio’s Maracana stadium. Ponderous and porous, the German back line also features center backs playing as full backs, allowing Algeria’s speedy forwards to cause havoc in the Round of 16 match that Germany won 2-1 in extra time. That’s why Neuer was called on so many times to race out of his area and play the “sweeper” role, rescuing his defenders. Deschamps will likely be wrestling with two selection dilemmas ahead of the match, chiefly who to partner with Karim Benzema in attack out of Olivier Giroud and Antoine Griezmann. Giroud has height and presence, but Griezmann offers guile and craft and they might be the qualities that will give the Germany defense more problems. Griezmann’s game-changing substitute appearance in France’s 2-0 win over Nigeria in the second round could well influence Deschamps’ thinking. There is also the question of who plays alongside Raphael Varane at center back out of Laurent Koscielny and Mamadou Sakho, the vice-captain who is fit again after a left hamstring injury. If the French progress past the quarterfinals, they will have done better than most pundits would have predicted, especially with Deschamps having revamped the team in his two years in charge. Though expectations have been raised back in France, there will be more pressure on Germany. And expect Neuer to continue making appearances outside the penalty area as well as inside, just like Schumacher did 32 years ago.